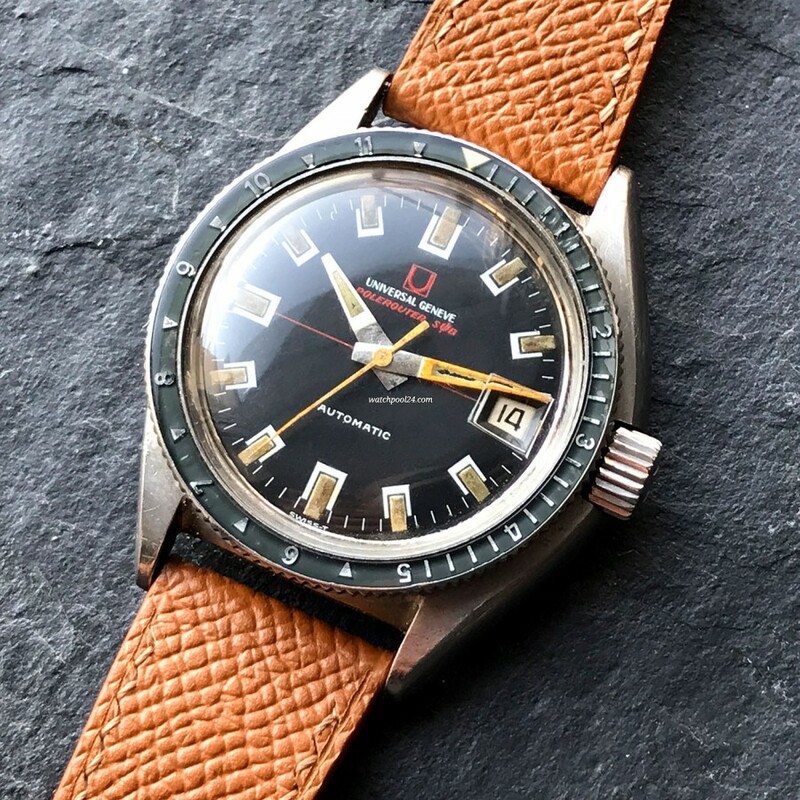 The Universal Genève Polerouter Sub definitely should not be missed in any discussion about collectable vintage diver watches. Here we offer a greatly preserved example of the reference 869123/02 from 1968. The most components of the Polerouter Sub served a specific purpose. For example, the asymmetrical shape of the case was not designed for a better look but for protecting the watch during diving. The case was built thicker on the crown side in order to better protect the screwed crown. The case design was made by the famous designer Gerald Genta. Another important function is fulfilled by the orange minute hand. Underwater, the diver must be able to read the duration of the dive from the bezel as fast as possible. Due to the orange color, the relevant minute hand stands out and the confusion with the hour hand is practically eliminated. In the earlier model, the minute and hour hands differed only in their size. Thus, with this new hands configuration an essential function has been improved. The case has sharp edges and is in super authentic condition. The reference and serial numbers are still visible on the screwed caseback, which is very rare as the most Vintage Universal Genève watches have been polished several times over the years. The crown is original and signed with the UG logo. The big hour markers are original and full intact. The tritium lume aged evenly to a dark brown shade. The acrylic crystal has a built-in magnifying glass, which enlarges the date at 3 o'clock. The luminous mass of the minute hand has a small perforation in the middle. The matte black dial surface is perfect. The gray bakelite bezel is rotatable in both directions and is also in perfect condition. The movement of this Polerouter Sub is the caliber 1-69 by Universal Genève. It has been checked and runs flawlessly. This vintage diver's watch from Universal Genève has been preserved in an authentic condition and scores with its historical relevance, reliable technology and deliberate design.